A Google search of that very term, "election 2016," yielded more than 285 million news results today. That's five million more searches than the search term rendered last Friday. And that number will likely continue to rise, particularly thanks to the recent emergence of new smear campaigns. That's why we at Money Morning have gathered the latest, most relevant 2016 election information to keep you updated on what's happening in the world of politics. Questions arose last week regarding Republican presidential candidate and former neurosurgeon Ben Carson's self-described rise from the streets of Detroit to success as a world-renowned Johns Hopkins neurosurgeon. It started when the leading GOP candidate admitted that his timeline was possibly incorrect about meeting General William Westmoreland on Memorial Day in 1969 and subsequently being offered a scholarship to West Point. 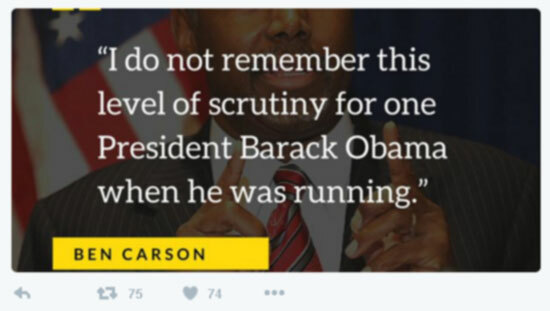 That was a crucial point in Carson's book. But Carson's campaign countered the news, "broke" by Politico on Friday, with a statement detailing the left-leaning site's inaccuracies. The publication substantially revised its story over the weekend. Carson spent the better part of last Friday, as well as the entire weekend, aggressively rebutting media reports about his past. He admonished the media outlets for their desperate digging: "The vetting that you all did with President Obama doesn't even come close, doesn't even come close to what you guys are trying to do in my case, and you're just going to keep going back, 'He said this 12 years ago' – it is just garbage," he said. "Give me a break." According to NBC, Saturday Night Live had a whopping 6.6 household rating on Saturday night. The episode was controversially hosted by Republican presidential candidate Donald Trump. It easily beat the season's previous high, which was the 41st season premiere last month, hosted by Miley Cyrus, featuring a guest spot by none other than… Democratic front-runner Hillary Clinton. 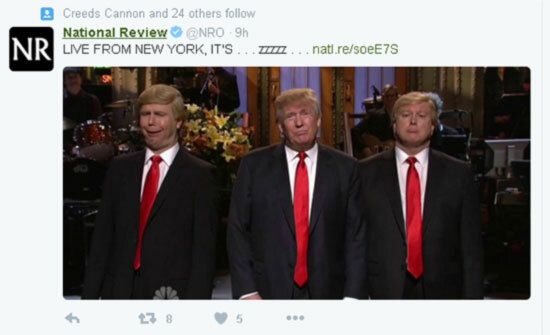 In fact, Trump's overnight rating was 47% higher than the Miley/Hillary episode. Newly released credit card statements from early in Florida Sen. Marco Rubio's term show a pattern of falling behind on payments. They also highlight a discrepancy between personal and political spending. According to a CNN report released this morning, in 2007 and 2008, the young presidential candidate used the Florida GOP American Express card 73 times for his own use, accruing $22,003.19 in personal debt of the account's $117,294.73 total. That amounts to just under 20% of the statement's grand total. Rubio has repeatedly called the personal charges on the state GOP-issued card a mistake. Regardless of this controversy, Rubio is winning the financial backing from some of the party's most prominent donors, including New York billionaire GOP donor Paul Singer, who switched his allegiance from Jeb Bush to Rubio after Bush attacked the young senator at the last debate. Rubio also picked up more political support last week as three fellow senators officially endorsed him – Sens. Cory Gardner (R-CO), Steve Daines (R-MT) and Jim Risch (R-ID). "I do support the use of medical marijuana," Democratic front-runner Hillary Clinton said at a town hall meeting at Claflin University in South Carolina, reported The Washington Post on Saturday. "And I think even there we need to do a lot more research so that we know exactly how we're going to help people for whom medical marijuana provides relief." This statements comes almost a month after Clinton declined to take a position on legalizing marijuana in the CNN Democratic debate. The fourth Republican presidential debate will be Tuesday, Nov. 10, live from the Milwaukee Theatre in Milwaukee, Wisconsin. The debate will air on FOX Business Network at 9:00 p.m. ET and be streamed for free on foxbusiness.com. It is expected that the showdown will cover the same topics as the previous debates: taxes, the economy, and international issues. The second Democratic debate will be the first since the Democratic field narrowed to three candidates: former Secretary of State Hillary Clinton, Vermont Sen. Bernie Sanders, and former Maryland Gov. Martin O'Malley. John Dickerson, the host of CBS News' "Face the Nation," will be one of the event's four moderators, assisted by Nancy Cordes, CBS' congressional correspondent; Kevin Cooney, anchor for KCCI-TV, the local CBS affiliate; and Des Moines Register political columnist Kathie Obradovich. The debate will air on CBS on Saturday, Nov. 14, at 9 p.m. ET.